It's my birthday, let's celebrate! 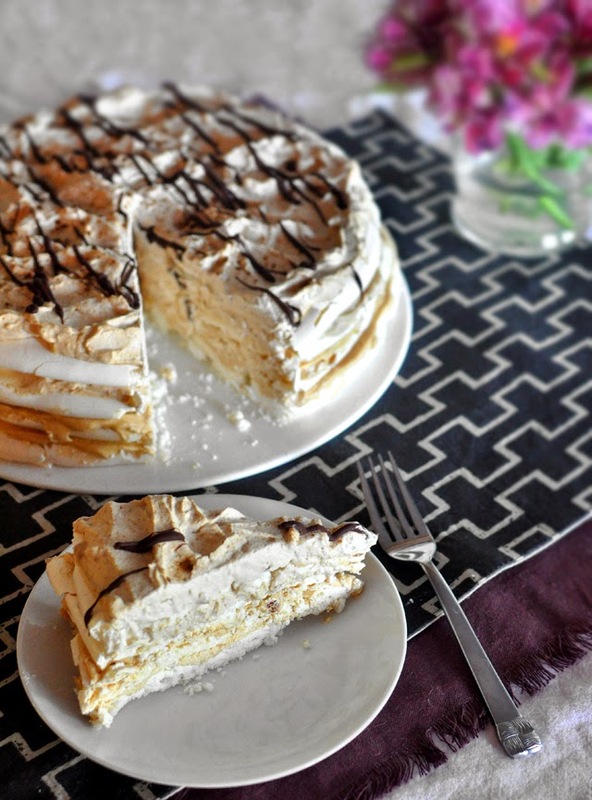 Let's celebrate with this awesome Coffee Pavlova cake, because it's an awesome cake. 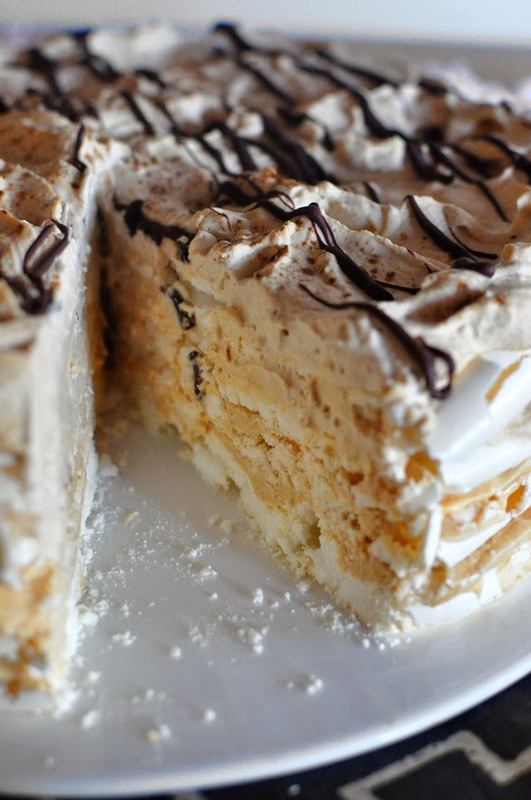 Obviously you need to like coffee flavor to like this, but if you do I pretty much guarantee you will go bananas for this cake. Being the middle of the summer I got some raspberries on the farmers market when planing a Pavlova cake, but let's just say my kiddos got to those before they ever made it anywhere near the cake. Apparently there is nothing better than yogurt with raspberries. I'm a lucky mama. Put the egg whites in a mixer and blend until you start getting white ribbons but it is all very soft. Start adding the sugars slowly one tablespoon at the time and mix until you get shiny snow peaks and it looks 'marshmallowy'. Prepare four sheets of baking paper and form a desired width circle from you egg whites on each sheet. The thickness you are going for is about half an inch. I have a pan that when turned upside down fits two large circles next to each other so I do it in two times. My mom often bakes just rectangular shape and makes it in that shape. Whatever works best for you is just fine. Bake for 10 minutes on 300 F and then 1 1/2 to 2 hours on 200 F. The meringue should remain closest to the beginning white as possible. Cool off completely. They can keep really well like this for a few days so it's great to make ahead. I just loosely put them in a grocery back and keep in a dry place where they are out of reach because they can be quite fragile. This couldn't be more simple. I used to mess with a pastry cream type of filling but now I just whip up some heavy cream with the sugar and rest of the ingredients. Just make sure to mix up the instant coffee powder with water before adding it to the heavy cream. 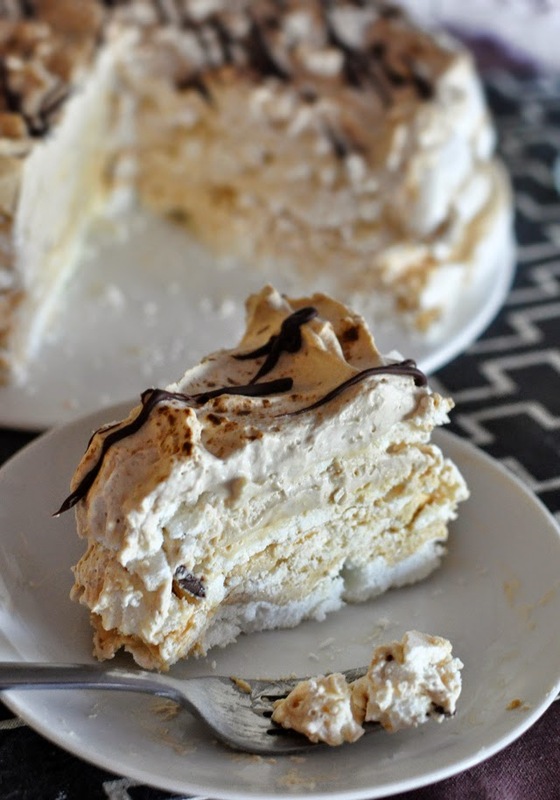 Assemble the cake by spreading the coffee and heavy cream mix in between and on the top of the meringue layers, finish it of with a drizzle of melted chocolate (I do 30 second intervals in the microwave) and if so desired sprinkle some chopped hazelnuts on top as well. This is a very rich in flavor but so light in texture. 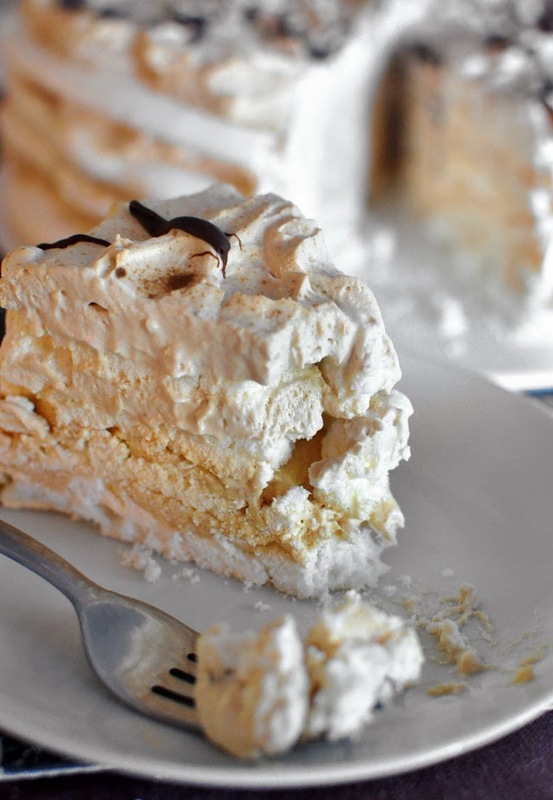 It should be made a day in advance so that the filling softens the meringue a bit and because it is so light in texture I think it's perfect for Summer. Enjoy!